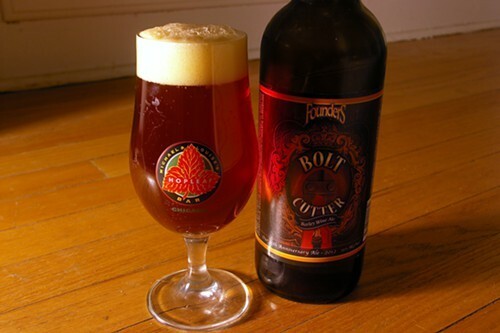 To celebrate their 15th year in business, the folks at Founders Brewing in Grand Rapids, Michigan, have released a powerful barrel-aged barleywine called Bolt Cutter. "Dry-hopped with a mountain of Cascade hops," says the brewery, "it's balanced by a malty sweetness and spicy complexity, resulting from barrel aging some of it in bourbon barrels, some in maple syrup-bourbon barrels and some not at all." This barreling scheme is similar to the one Founders used for their excellent 2009 Nemesis release, though that was a wheat wine. 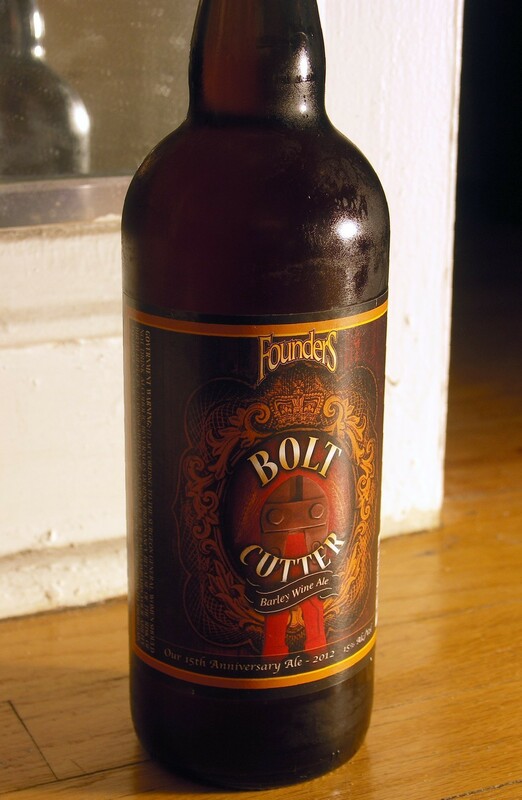 Bolt Cutter has been resting in bottles and kegs since July—a fine idea for a beer that's 15 percent alcohol, which might otherwise be harsh and hot. It came out last month. Vice president Dave Engbers bought a pair of bolt cutters, in case the bank followed through on its threat. “We were determined to keep our doors open and to keep brewing beer, no matter what it took," he writes. "Luckily, we never had to use them." He still keeps the bolt cutter in his office. Bolt Cutter is the color of red copper, with a sticky, clingy head almost like a meringue. It smells of bourbon and maple, unsurprisingly, plus vanilla, toffee, and bread pudding—and as it warms, the hops come forward, adding tangerine, cedar, and apricot. I'm also picking up some aromas that I'm convinced come from the yeasts—a touch of wine and yellow miso broth, strangely. The taste is super boozy, with a stinging burst of prickly carbonation. The bourbon and maple don't exactly dominate, but they're present again, of course, along with a complicated mix of sweet, savory, and spicy flavors: grilled pineapple, butterscotch, pecan pancakes, rum-soaked raisins, and sticky cinnamon rolls, with a whiff of cigar tobacco and a faint roastiness like a well-browned biscuit. The sweetness is cut by a clean bitterness like white grapefruit peel that lingers in the finish. I wish I had another bottle to lay down for a year or so, to round the edge off the alcohol and let the flavors blend and mellow—I'm sure it'd be even more amazing then. I picked up my Bolt Cutter at the liquor store attached to the Sheridan "L" Lounge, where I found Three Floyds' Rye da Tiger a few weeks back. In Fine Spirits in Andersonville had at least five bottles as of yesterday. Unfortunately it's far from cheap, and you can expect to pay around 25 dollars for yours—this is the beer that finally motivated me to figure out how to expense something at work. Legendary English death-metal band Bolt Thrower, founded in Coventry in 1986, take their name from a different kind of bolt—the sort fired by a heavy crossbowlike weapon in the tabletop battle game Warhammer. Bassist Jo Bench, who joined in 1987, is considered one of the first women to play in an extreme-metal band, at least according to Encyclopaedia Metallum. Bolt Thrower are playing two very rare stateside shows in 2013. The first is part of Maryland Deathfest on Thursday, May 23, in Baltimore, but it's already sold out. They'll also be at Chaos in Tejas, which runs from May 30 till June 2 in Austin; the organizers haven't announced a day-by-day schedule, but Bolt Thrower will definitely get a plum spot, since they're front and center in the ad. On YouTube I've found an HD stream of the band's most recent full-length, 2005's Those Once Loyal, for which my preferred vocalist, Karl Willetts, returned to replace Dave Ingram. You'll never hear death metal that does a better job combining martial drive with infectious groove.